On this page we show some of the products we have recently featured, in reverse date order. Some of these are made from the soft alpaca fibre. 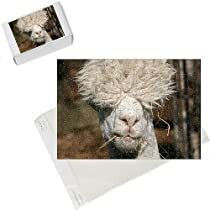 Others depict alpacas, for example in art work, jigsaws or toys. Here are four alpaca gift suggestions at widely varying prices. We’ve included a book of twenty-five beautiful alpaca garment designs from Peru – here sourced from Foyles of London. The other three items come from John Lewis: a gorgeous black coat (in 52%/48% alpaca/wool), a man’s jumper in alpaca/cotton mix, and a luxuriously soft alpaca throw (200cm x 150cm) for your sofa or your bed. If these don’t quite fit what you’re looking for click on one of them nonetheless and see what more there is on the site to which you are taken. We have previously posted details of Steiff’s beautiful Alpaca White Polar Bear and also their “Limited Edition Giant Alpaca Moon Bear“. Each of these is a wonderful production which will delight children and older collectors alike, and with good care should retain value down the generations. They are the larger “giant” models, 60cm and more in length. This beautiful 18cm brown bear made of soft alpaca is also from the world-famous maker of stuffed toy bears, Steiff. It is fully jointed, has a genuine leather collar, and will give pleasure for many years. 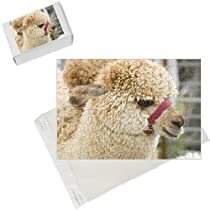 These alpaca jigsaws will make excellent birthday or Christmas gifts for family members and friends. Here is a small selection. Click on a graphic to get price details and to order securely through Amazon.co.uk.